The Ganga, which is already in bad shape due to increasing pollution and decreasing water, is now also swiftly moving away from its banks in Patna, the capital of the Indian state of Bihar. 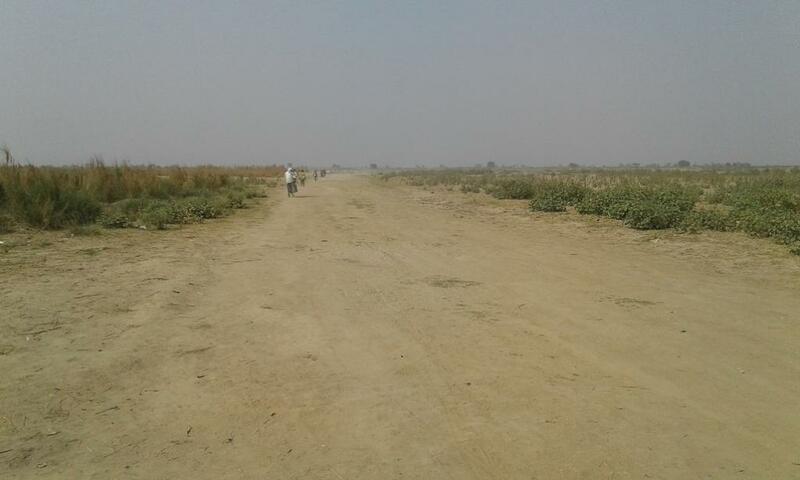 No serious scientific attempt has been made to deal with this crisis, warned experts and activists, while at the same time an ambitious project Ganga-Pathway project – to build an 20.5 kilometre elevated road in the river to ease traffic problems – is underway, posing a new threat. Ramakar Jha, from the National Institute of Technology, Patna, warned that river Ganga has already shifted 2.5 – 3.5 kilometres from most ghats (a series of steps leading down to a river) in Patna in recent years due to man-made interference. The ongoing construction of Ganga-Pathway will certainly push it further away. In some places, the river has been shifted after work started, but by the time it is finished, the river will have completely moved away from the city. He also pointed out the dangers of constructing deep into the river. 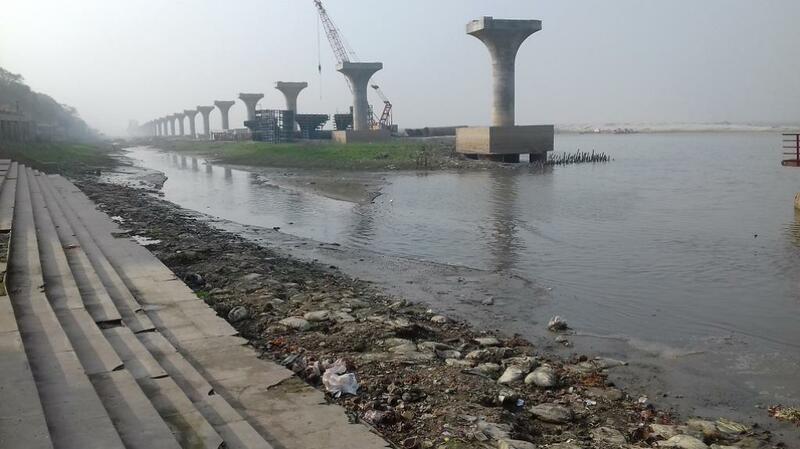 As the Ganga experiences massive flooding annually from Patna to Farakka, a great amount of silt will be deposited at the pillars being constructed to support the elevated road. The consequences of this are hard to foresee, but they are unlikely to be good. This is at a time when beautification work is being carried out of 20 ghats in Patna under as part of the USD 1.5 billion National Ganga River Basin Project, supported by the World Bank. “What is the use when the Ganga has already shifted away from Patna? It is impossible for visitors to catch a glimpse of the river from most of the ghats,” said Ranjeev, a local activist working on the river. “Ghats now welcome visitors with dry sand all around and no natural sound of the flowing river,” he added. “Heavy deposit of siltation, the depletion of water flow over the years, and encroachments by powerful builder lobby from Digha to Rajapur” have diverted the river’s flow. 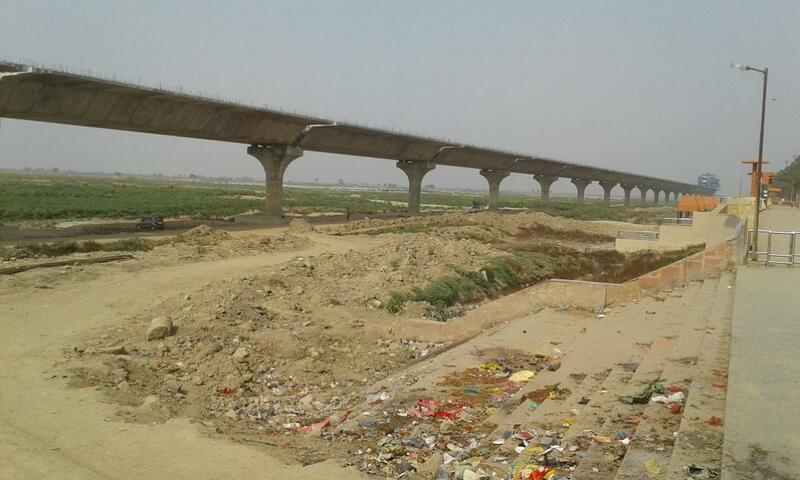 The managing director of the Bihar Urban Infrastructure Development Corporation (BUIDCO), Amrendra Prasad Singh, said that the beautification work of 16 out of 20 ghats has been completed. 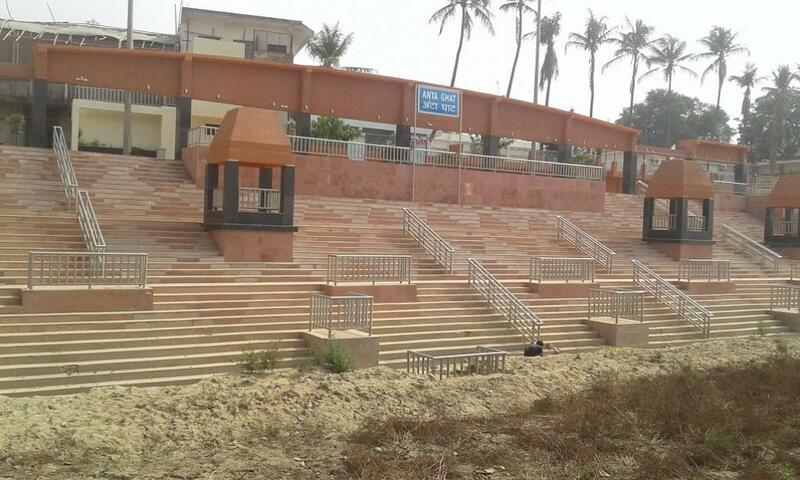 “The top officials of the state administration are serious to bring back the river to these ghats” .The foundation stone for the project was laid by the Chief Minister of Bihar, Nitish, Kumar in February 2014 and it was initially slated to be completed by June 2016, but it has been delayed. Kedar Nath Jha, the 92 year old priest of a temple at Collectorate ghat, has been a worried witness to the slow shifting away of the Ganga. He has lived there for the last 49 years and blames interventions in the name of development for the problem. “Now only filth, silt and dry sand of Ganga is found nearby,” he said. It is a bad sign for Maa Ganga (Mother Ganga), he said. “It will be difficult for the young generation to accept that river water was flowing near Collectorate ghat until 4-5 years ago and devotees used to take a holy dip and offer Ganga water at the temple,” Jha said. He recalled that Collectorate ghat’s temple was one of the most crowded, as hundreds used to visit to offer prayers and have close glimpse of the river until a decade ago. Everything has gone now. With the river shifted nearly 3.5 kilometres from the Collecotarate ghat, hardly any devotee visits anymore. 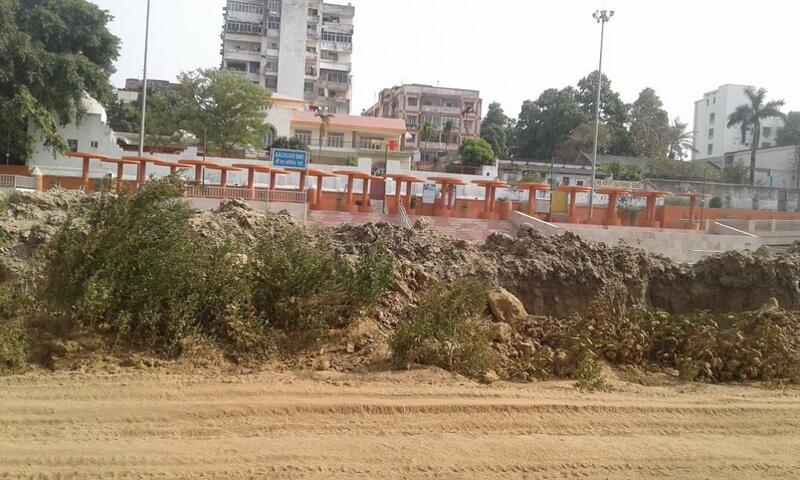 “Look at this dirty narrow nala (drain) that has replaced Gangaji here”, rued Jha. Jha has expressed his helplessness and pain for not able to raise objection to much hyped chief minister Nitish Kumar’s ambitious Ganga Pathway project. He said that the river has shifted from Collectorate ghat since work started for the Ganga-Pathway. “Ganga ruth ke nahi gayee; Ganga ko pulwala bhagaya hai (The Ganga has not left out of annoyance; it has been forced out by the bridge builders),” Jha said angrily. The priest of the Adalat ghat temple, Baba Mahant Manohar Das, said it is a reality that Ganga has shifted far away from the ghat. This has also ended the charm of the temple. “The number of visitors to our temples has reduced drastically due to shifting of the Ganga away from it. Whatever water in a nearby channel is seen is that of a dirty nala (drain),”he said. At present dozens of boats, mostly motor boats have been operating at least 2.5-3.5 kilometres away from the river banks to ferry hundreds of villagers of riverine villages for the last few years. Only during monsoon when water filled the dry patch, these motorboats operate from nearby of the ghats. Guddu Baba, who has led the Ganga Bachao Andolan (Save Ganga Movement) for the last two decades here, said Ganga is continuing to move away from Patna .This trend is visible since the 1990s but it has speeded up. Three years ago the Bihar government’s water resources department along with Inland Waterways Authority of India had initiated steps to bring the river’s stream back to its original course by creating a 7 kilometre long and 15 feet deep channel from Digha to Kalighat. This was in response to a directive by the Patna High Court in response to a Public Interest Litigation case filed against the project. But efforts have failed to bring the river Ganga close to its southern banks despite INR 80 million (USD 1.2 million) spent to create the channel. According to a study by a team of researchers from the department of environment at A N College, Patna, the Ganga is shifting 0.14 kilometres away every year in Patna. The study largely blames the lack of dredging of the riverbed for the last 30 years and large-scale discharge of untreated sewage in the river. In the days when steamers used to navigate the river in the state capital, dredgers from Denmark used to dredge the riverbed before every rainy season. According to officials, deep dredging of the trench could not be done in the channel after the IWAI refused to carry it due to heavy discharge of untreated waste, including solid waste. Regular disposal of sludge-carrying drain water has made it hard to restore the original course of the river. The ongoing construction of Ganga pathway has also proved stumbling block to dredge the channel to ensure the smooth flow of water. However, the chief engineer of the water resources department (WRD) Lakshaman Jha claimed that the channel would be restored by 2019 as five proposed sewerage treatment plants (STPs) will be operationalised. The work is underway for five STPs that were launched by the Indian Prime Minister last year to treat nearly 350 million litres per day (MLD) of waste water under the Namami Gange project. The chairman of the Bihar Pollution Control Board, Ashok Ghosh, said that unless the STPs are functional, it is difficult to think of a clean Ganga in Patna, which is essential to deal with the water issues.